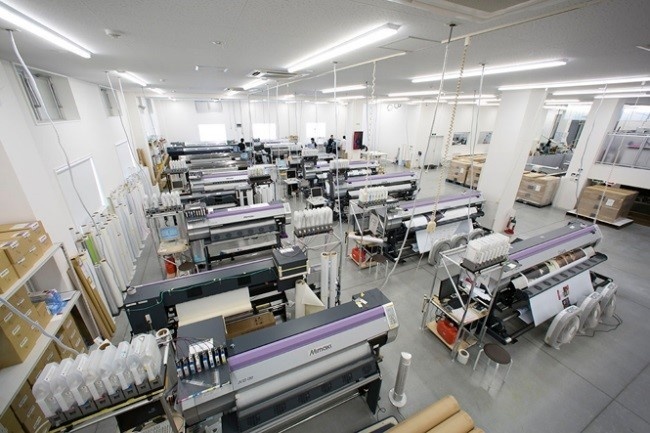 Sign Artec (Hanno, Saitama, Japan) is one of the largest printing companies in Japan, and provides sales and promotional products by capitalizing on 30 inkjet printer units to meet clients' needs--for instance, quality requirements and urgent orders. 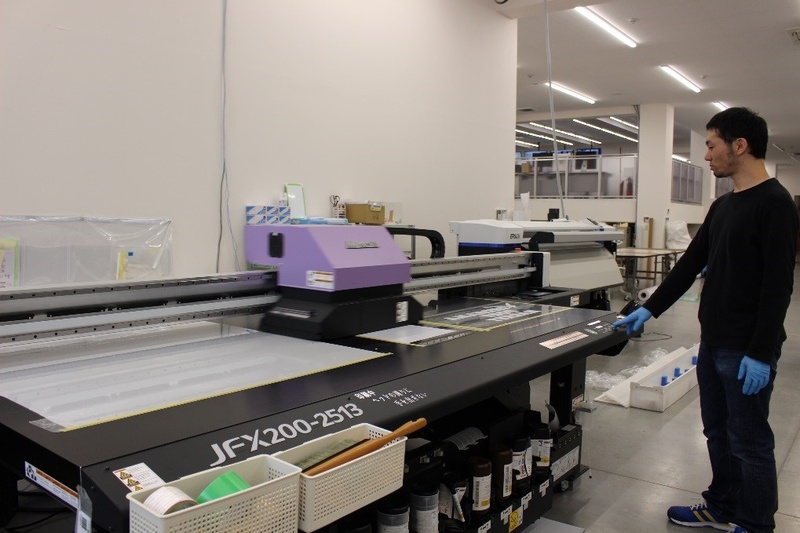 In May 2016, the company installed Mimaki JFX200-2513, a flatbed inkjet printer, equipped with UV-LED lamps. Unlike metal-halide lamps, the UV-LED lamp doesn't generate heat; this property allows printing on heat-sensitive materials without deforming them. Sign Artec was founded in 1991, and shifted to Hanno Okawara Industrial Park in 2013. Spacious factories (total floor space: 2,353㎡) are built on expansive grounds (5,500㎡). Various types of equipment are installed in the factories: inkjet printers, large industrial sewing machines, welding machines (hybrid, high frequency, automatic, and hot plate types), cutting plotters, multi-cutting machines, high-speed finishing cutters, automatic eyelet machines, and laminators. Details of inkjet printers used in Sign Artec include roll-to-roll types (1,300 mm to 5,000 mm wide) and wide/compact flatbed UV-curable printers. Along with facility expansion, the company business is growing quickly, and the number of employees has increased to 60. "We would like to build the foundation of the company including reviewing work processes, setting up a system to prevent mistakes or to improve internal communication for sharing correct information, and enhancing human resources development," said Mr. Yamabayashi, Chief Director. The company aims to enhance clients' confidence by minimizing the occurrence of mistakes or difficulties. JFX200-2513 replaced the conventional metal-halide UV-curable printer. The company was using a flatbed printer made by a foreign manufacturer for printing on rigid boards, films, and soft vinyl materials. Sometimes, however, the printer damaged sensitive materials due to heat generated by metal-halide lamps. This spring, printheads collided and damaged a soft vinyl surface due to heating. The company urgently needed a replacement to continue production, but cost and a late estimated delivery time caused difficulty. However, Mimaki JFX200-2513 met all requirements including budget and delivery time. Its affordable price, less than ten million Japanese yen, was very attractive compared to the more expensive models with similar performance. Furthermore, the low-heat UV-LED lamp allowed printing on heat-sensitive materials without any constraints. The JFX200-2513 is an entry model, but has almost everything required for flatbed inkjet printers, including performance, quality, usability, and ecological consciousness--all accumulated over long years of refinement. Moreover, this model can print objects up to 50 mm thick and on special materials with high weather and scratch resistance. The company has already been using other Mimaki inkjet printer models and highly appreciates their satisfying technical services, including quick parts delivery. 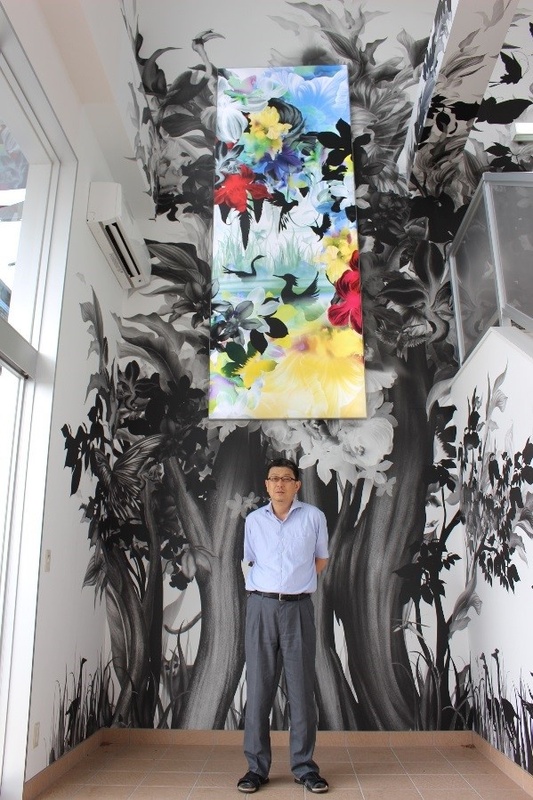 This January, the company decorated its entrance with inkjet-printed wallpaper and fabric. Graphic arts on decorations were designed by Ms. Kahori Maki, who has created many works for her clients. The entrance has been dramatically transformed into an artistic space. Ms. Maki's graphic art was printed on wallpaper (W 7,100 mm x L 7,200 mm), which was then applied to the wall. Additionally, a fabric frame was attached to the wall to add an accent. This frame displays the graphic as if it hangs on the wall without support. "Ms. Maki was inspired by nature here in the Hanno city area, and she designed graphics for us. Birds, cats, and insects are motifs in this forest picture," said Mr. Yamabayashi. The Olympic games will be held in Tokyo, Japan, in 2020. A considerable number of hotels and commercial facilities are promoting redecoration, so the company estimates that their business will increase. To accommodate increased orders and satisfy clients' requirements, the company will also increase business investment and solidify the company's base.